Cubis is proud to be leading innovation in creating effective safe work solutions. 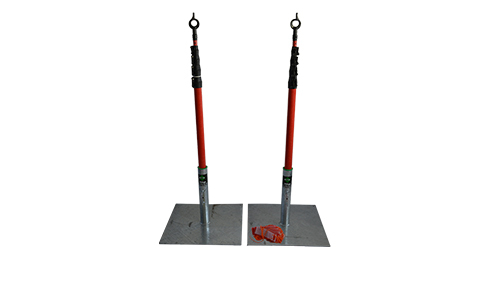 Guardian Goalposts are an overhead warning system that effectively isolates hazards and visibly enforces safety zones across work sites. Cubis Systems' Guardian Goalposts are a lightweight and non-conductive telescopic pole system providing highly visible proximity warning of nearby overhead cables. Meeting both Australian Constructors Association guidelines and Safe Work Australia standards, Guardian Goalposts are rapidly and easily assembled to 6m high by one operative, then packed up and transported to the next site after use. The posts are manufactured in non-conductive Glass Reinforced Polyester Resign (GRP) and are linked together by bunting or a solid telescopic cross-bar. A nightwork illumination options are also available. Each post is fixed in weighted bases, fabricated in galvanised steel, and can be marked with your company information. 2 x 6m red/white telescopic poles (retract to 1.6m). 2 x galvanised steel bases. 1 x 25m length of red/white warning bunting. 6.7m solid telescopic retractable cross-bar. 1.6m illuminated telescopic pole for nightworks. Click here for more information and resources on CUBIS' Guardian Goalposts. For further information on Cubis' Guardian Goalposts, please contact CUBIS Systems or visit www.cubis-systems.com today. I would like to enquire about CUBIS Systems.